5% Domestic Business Growth Just Doesn’t Cut It! 20% + global business does. How many times a day or week have you asked business colleagues "How's business?" The answer I hear a lot is, "It’s slow, not much growth, last several quarters sucked. But what are ya gonna do? How can an SMB achieve business grow in this economy?" It's a fair question because these are indeed tough, scary times. The US economy is unpredictable, seemingly unstable and mostly unfriendly when it comes to owning and operating a small or medium-sized business. Just as many B2B companies have continued to embrace decreasingly effective and traditional sales and marketing models, many have also resisted the recommendation to pursue the enormous global growth opportunities that are available. So where’s the Business Growth Opportunity? According to a SBA.gov / Report to the President on the National Export Initiative, 95% of the world’s consumers are outside the US and only 5% of American companies export states the US Department of Commerce. In both cases breaking out from the 5% substantially increases a company’s growth opportunity. Companies that have hesitated face a big task for sure. But there are abundant resources available to support their global initiatives, and compelling reasons why they should begin. As they endeavor to regain growth momentum with more effective domestic approaches (inbound marketing) they can concurrently begin to explore the prospects that global expansion affords. The metrics are incontrovertible and overwhelming. Incremental growth will be primarily found in foreign markets. Certainly companies with innovative products and strong competitive positioning can create domestic growth, but that growth will be extracted from a nearly “zero sum” environment. In other words domestic growth will come at the expense of competitors. In contrast foreign markets offer absolute growth AND opportunity for early advantage. As clearly exemplified above, 2012 is the watershed year. 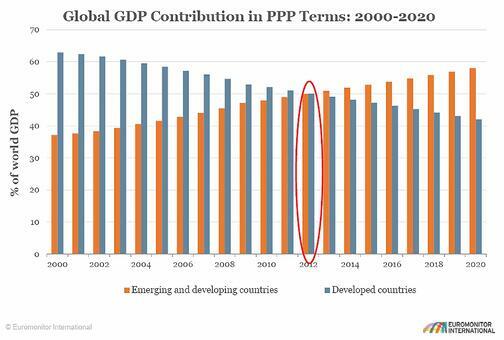 Euromonitor International predicts that global GDP growth in coming years will originate in emerging and developing markets rather than traditional ones. Looking further out, the trends in consumption are compelling. 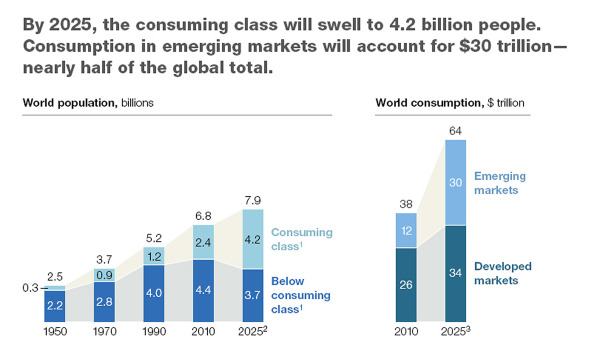 According to a quarterly report by McKinsey, Growth in consumption between 2010 and 2025 will be substantially concentrated in emerging markets. How does this fit with my existing sales and marketing strategy? Companies focused on growth need to consider parallel paths of evolutionary marketing and new markets. Although emphasis and resource allocation will vary, it is important to recognize that these two approaches represent parallel and viable avenues to growth. More specifically, however, the same inbound marketing methodology that we suggest will power increased domestic sales will simultaneously generate intriguing international prospects. Even companies that focus their content effort in American English and optimization on a .com TLD (top level domain) website with American English keywords will find a large number of international leads. Many will be low quality. However a meaningful percentage will be real and substantial. Some simple data mining will elucidate where pockets of potentially profitable demand lie, and focused strategies can be developed to target those leads. This domestic initiative can then be internationalized with TLDs for targeted markets, localized keywords and appropriate content, and automation (drip emails / texts) localized for language and culture. In practice this means that the same fundamentally economical lead-generation methods that work domestically can be economically applied on a global scale. This creates huge opportunities for global lead generation driven from a domestic office with a modest staff...and opportunity companies would be foolish to ignore regardless of how intimidating they find export at first blush. A change in approach is critical to success. B2B sales and marketing efforts are at a crossroads. Traditional approaches clearly generate decreasing results. There is a vague awareness that things are different, yet in many cases not yet a crisis in revenue to prompt a dramatic change. This creates an opportunity for senior executives to respond before businesses are too distressed to recover. But the response must be appropriate to the different environment rather than simply tweaks of existing models. Ample research substantiates the evolution of marketing methods to satisfy new buying models. Tools and models are inexpensive and readily available, and the increased effectiveness and demonstrable value of inbound marketing methodologies make implementation even for small companies feasible. But the clock is ticking. According to a 2012 report from Optify.net on B2B Content Marketing Trends, 83.5% of B2B marketers are increasing their use of content – many ‘significantly’. Delay will result in a marketing deficit. Rarely is a fundamental shift in business as clear in real-time as this change in the nature of the sales & purchasing processes. Executives committed to the viability of their companies have a huge opportunity to identify and adopt best practices. In our recently published book on The Current State of B2B Sales & Marketing, Why owners and “C” Level execs should be pumped and VPs of Sales & Marketing should be terrified, we address both the conditions of today’s market and provide clear examples on how to fix it.